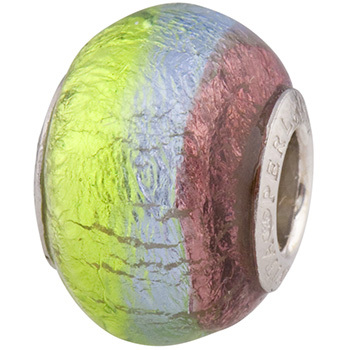 PERLAVITA our own branded line of large hold beads featuring Tri color Round Rondell Large Hole Murano Glass Beads with Sterling Silver insert. Aqua/Blue and Amethyst in a rainbow. Fits popular bracelet ystems well as other 3.5 to 4.5 mm chains. Authentic Murano Glass.